From the name of the temple, you may be confused, ‘What’s in the temple? Chickens of monkeys?’. Well, here’s the truth. The temples is called ‘Wat Khai’, for short. The reason that made the temple had something to do with chickens started years ago. 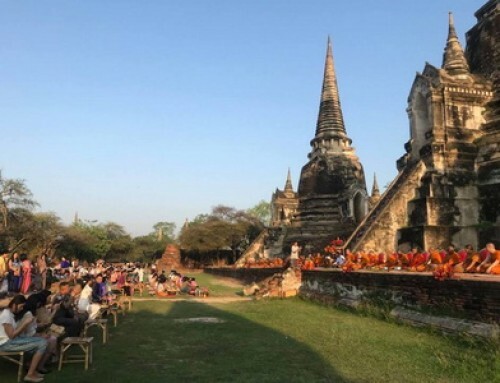 The temple has been existed since Ayutthaya Period. The temple was abandoned after a battle with Burmese force. However, a group of monks came in and perfectly renovated the temple, turned it into a monk office. Finally, it was changed into a temple. And because of the death of many chickens due to a plague, the temple has been called ‘Wat Khai’. The name tells you about chicken, but you will meet monkeys when you go there. Sounds strange, huh? Anyway, these monkeys are really cute. You may just drive to the temple, walk around for sightseeing, take photos, make some merit, pay respect to some architectures, then you can play with the monkeys before you leave. There are everywhere. They’re small and active. They may be on grass, trees, or anything else. Be nice to them. Don’t tease or bully them, as they will be hurt and scared. You can feed them. Just pass your food to their hands. Don’t be afraid. They’re cute. But don’t touch them too much, as some monkeys may be mischievous and play with you in a harsh way. Wat Khai Mee Ling is located in Han Sang District, which is only about 25 kilometres away from the heart of Ayutthaya. Just drive along the Highway No. 32 and you will see the way, which will lead you to the temple, on your right side. Just go through the path for about 600 metres. Then you will see the temple, with a chicken statue and a monkey statue at the entrance.